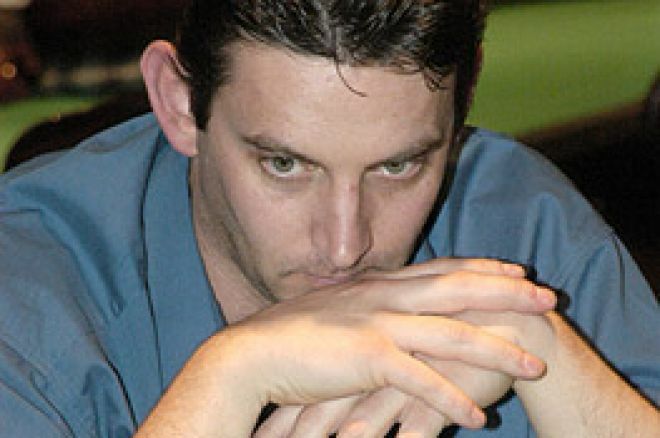 Part 2 of Tony Bromham's conversation with Ireland-based English poker player, Roy "The Boy" Brindley, is as full of punch as the first part. Last time, the WSOP venue was put in its place; this time Roy discusses sponsorships, TV commentaries and offers advice to new live players. You have a long line of cashes at tournaments going back a few years now ( *see list of top two finishes at the end of this interview). What would you say is your most satisfactory result in your poker career and why? Probably landing an event at the Helsinki Freezout in 2002 in front of my parents during the European Poker Awards. I really had only started playing in September 2001 and had claimed eight festival tournaments during 2002 (plus a second in the World Heads-Up Championship). I hoped that was good enough to claim the 'Rookie of the Year Award' but, alas, it wasn't. Still, it was nice win a tournament in front of the folks and beat a field that included the entire judging panel! There was also an Omaha/Hold'em tournament win during the British Open at the old Rainbow venue in Birmingham. Weeks beforehand the Paddy Power Poker tournament was broadcast on SKY Sports (it was the world's first commercially sponsored/televised tournament incidentally) which I won. On arrival in Birmingham I recall a guy telling me it was the worst poker he had ever seen and that now I am playing amongst the big boys I was going to be given a lesson on what real poker is all about. It vexed me so much I went on to win the tournament that night despite never having played a hand of Omaha in my life! You have a sponsorship deal with Ladbrokes. How often do you get to play on-line there and are the stakes low enough for the casual on-line player to have a go at taking your chips from you? Do you play under your real name or a nickname? Listen, I don't have the best sponsorship deal around by a long way but I can claim to be the first commercially sponsored player in Europe and, since the switch to Ladbrokes, three years ago, I think I have proved my worth. For me sponsorship involves a lot more than just wearing a t-shirt - and my sponsors, in return, have given me support during times of adversity and shared in their prosperity. Annual contract renewal discussions have been seamless with enhanced terms every year. From a standing start, Ladbrokespoker, the first UK betting firm to embrace the on-line poker concept, have held the mantle of Europe's biggest site from the outset, which is impressive considering the site is stand alone. On-line poker now accounts for 10% of Ladbrokes betting business. I feel proud to be associated with that success. Possibly I have become too synonymous with the Ladbrokes brand and that is holding me back somewhat by restricting my inclusion into some events and suitability for commentary but, until a better offer with long-term security is tabled, I'll not be moving on. I play a heads-up game on Ladbrokes each week with the winner of the best-of-three challenge having the shot of a rolled-up $1,000 a week. We have had it up and beyond $10,000 a few times. On-line tournament Hold'em play is not for me, similarly I find cash game Hold'em mindless. I do love Pot Limit Omaha though and see little difference between it and live game play. You will therefore see a fair bit of ROYTHEBOY on the $10/$20 and $15/$30 tables. As for the smaller players, I regularly go to the 10c/20c games and mess around. After having a good chat with the players there, all nursing somewhere between $1 and $10, I arrange for a bonus of $50 or $100 to go into their accounts. It's very satisfying. We get to hear your commentary and opinions on the play at many UK televised tournaments, such as the Poker Million and the British Poker Open. How do you enjoy doing these especially with the very amusing Jesse May? Are there any anecdotes you are allowed to share? Occasionally I'm way too outspoken and pull no punches when condemning poor play and bad players. It's not a pre-conceived thing I can assure you. With statements like "It's good news for the village of Monxton as your idiot is on his way home", I deserve all the stick I get in return. With the pre-recorded stuff you can have far more fun - although all the televised poker I have been involved in take the commentary live and, surprisingly, do not voice it over a finished show - and you can have some craic knowing the bad bits will be cut out. In last year's Poker Million heats I had a downer on poor old George Geary giving him the alias of "Dreary Geary" and stating "he has not overdosed on beauty pills," and "I hope he has a lawyer 'cos he's met a fraudulent hairdresser!" amongst my barrage. During a break I went to the green room where a distinguished gentleman about 7ft tall, battle-scarred with hands the size of shovels, approached me saying "I better introduce myself, I'm George's brother" ...at which point I thought, I'd better run! Do you play many cash games away from the tournament circuit and if so where do you play them? Do you have a favourite UK card room? I live in Ireland and have two smashing card playing casinos within a 45 minute drive in Dublin. Games there are lively and sizeable. I go through phases but, in all honesty, I play live cash games very little. As I said before, I would not consider playing cash games in a number of the continental casinos and, as for the UK's card rooms, their favourable tables charges are tempered by the fact there is little big-money action. This last year or two has seen a huge expansion in the popularity of the game. In your view, are there aspects of the game now that need improving to cope with these demands, both in the UK and on a wider scale? The gaming laws in the UK are both restrictive and vague. Once they are repealed we will see an improvement in game quality, venues and numbers playing. I continue to be dismayed at established players' hostility and intolerance towards novices who have been intimidated enough simply by sitting down in a live game for the first time. Finally, with the increase in the numbers of players from all walks of life, some are venturing into live card rooms for the first time. What is your advice to such a player who is only familiar with on-line play? Don't be intimidated and don't be embarrassed about making novice mistakes. Roy, it has been good talking with you, good luck. * These do not include Roy's many 'regional tournament' results, cash-game winnings or his on-line results, where he has won sums in excess of $50,000. Log on at Ladbrokespoker.com for the biggest games in the UK.